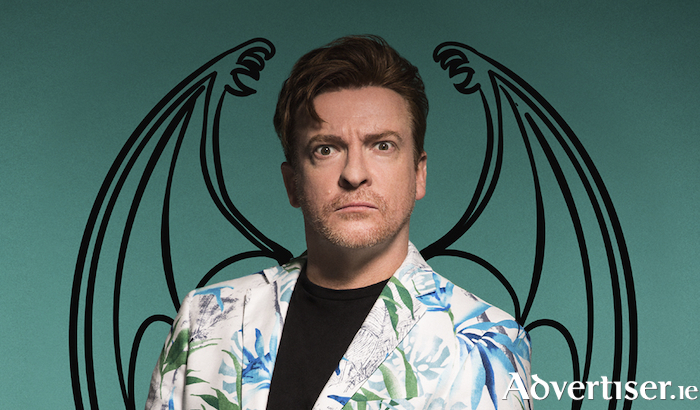 Rhys Darby - ready to take flight in Galway with Mystic Time Bird. Since moving to the US seven years ago, Darby has featured in a plethora of TV shows and films, from The X-Files and Voltron: Legendary Defender to A Series of Unfortunate Events and Jumanji. For all of his onscreen success, Rhys is never far from his stand-up roots. His live show is a sensational blend of sound effects, wacky characterizations, and askew observations. At the Comedy Carnival, Darby presents his latest show, Mystic Time Bird, which will also be recorded live at the Town Hall Theatre for future DVD release. In the show, he turns to the world of ancient mysticism to find answers to life’s problems. In doing so, Rhys learns he may have been a bird in a past life, and this information takes him - and the audience - on a unique, unforgettable, and hilarious journey of discovery and zaniness. How has Darby found life in Hollywood? Is it really full of folk running to their analysts and AA meetings in between stabbing each other in the back? “All that is definitely happening here, I’ve seen those things,” he laughs. “For the first two years I was here I was uncomfortable, I didn’t know the place and it was hard to find my niche. Once we got the children into school we made friends with other parents and that base level of friendship grounded my position and made it easier for me to do the endless meetings; and those first two years entailed a lot of meeting with various agents and doing auditions and trying to get projects off the ground. Darby moves on to talk about Mystic Time Bird. “It’s a really important piece for me because the basis of it came from my mother passing away two years ago. That really affected my life and made me take stock of who I was and where I was going. As regards the mysticism side, I’ve always been into alternative ideas on life. I was in Hawaii and I decided to go see a shaman – not as a joke but with an open mind." "I do wonder about an afterlife, we all get to a point where we wonder what happens when we die. This shaman told me I may have been a bird in a previous life. It sounds ridiculous but it made sense to me. I am very good at sound effects, I can mimic things and so that became the basis of the show; where am I going, what have I been in past lives – I could see a lot of comedy in that, so that’s how I created the show. It was also a way of me getting through the grief of my mother’s passing and having an optimistic idea of maybe seeing her again sometime.